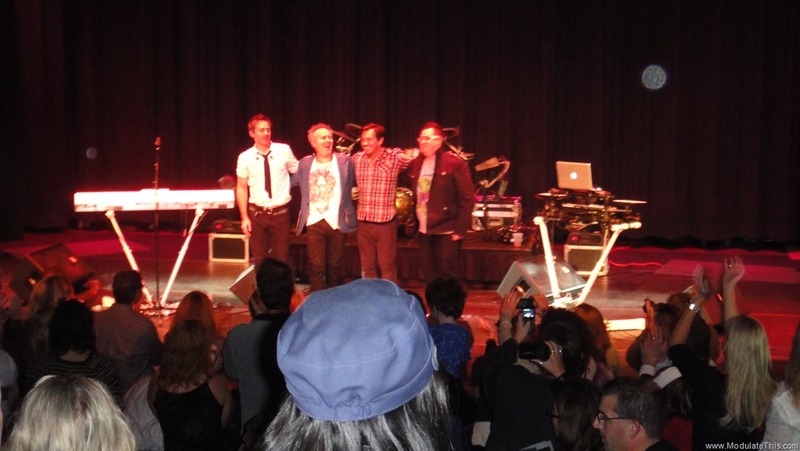 Last Friday I attended Howard Jones concert at the Boulton Center or the Performing Arts in New York. Here are a notes from the show. 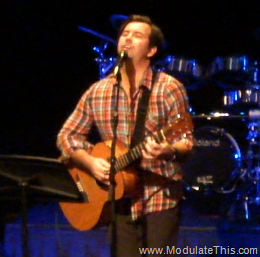 Duncan Sheik was the opening act. He sang and played his own accompaniment on acoustic guitar with some stories in between. Note – Duncan collaborated on Howard’s song, Someone You Need, and performed joined Howard's 25th Anniversary concert at the indigO2. Of course I enjoyed the hit “Barley Breathing”, my favorite song was “The Tale of Solomon Snell” off of his latest album Whisper House. It was was quite fitting for the Halloween season. Sheik’s acoustic set offered an excellent contrast and complimented Howard’s show well. 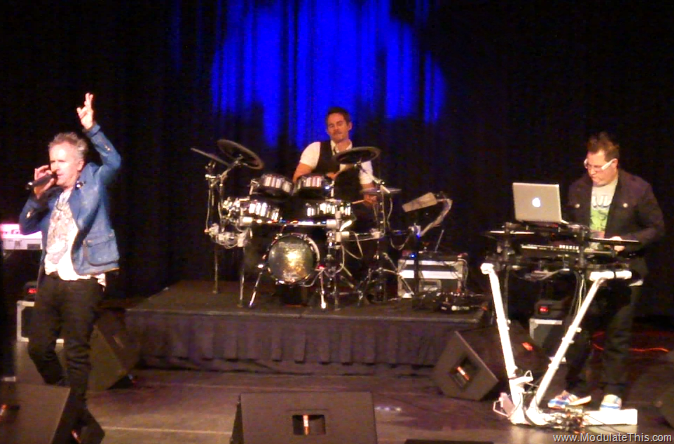 Howard performed in an Electric 3 piece band configuration with Robbie Bronnimann playing keys, doing live arrangements and sequence playback, and live mixing with Ableton Live; and Jonathan Atkinson on electronic drums. The set list was an excellent mix of classic Howard Jones songs with newer songs from recent albums Revolution of the Heart and Ordinary Heroes mixed in. One thing I really liked about this show was that although a lot of the songs were from Howard’s classic catalog, the show was not a “nostalgia act”. The arrangements were fresh and the performances were tight and had a vitality to them you could really feel. Having Robbie doing the heavy lifting with Ableton Live and live mixing freed up Howard up to focus on singing, playing and interacting with the crowd. It’s clear Howard is a seasoned artist who continues to take performance seriously and really connects with the audience. Jonathan Atkinson’s drumming also brought a human groove and interesting visual element to the performance. My favorite song of the night was “Equality”. 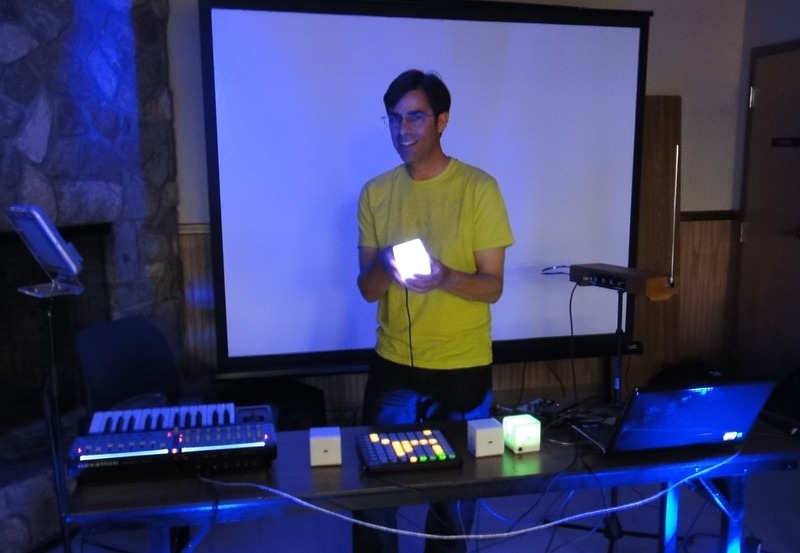 It started off with Robbie doing a real-time jam with all sorts of beat slicing using Novation Launchpad. Later in the show, Duncan Sheik came back on stage and he and Howard did a version of Tears for Fears “Shout”. After the show I got to meet and talk with Robbie Bronnimann about the show. 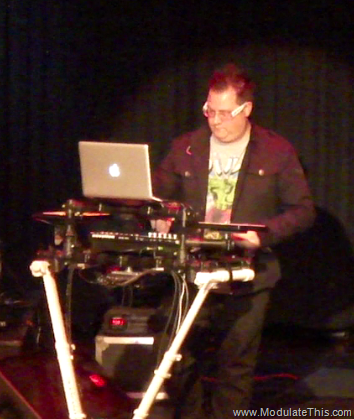 He’s using Ableton Live running on a Mac with a Novation Remote SL MK II which he uses to play keyboard parts. He also uses the Remote SL as a controller for Live devices. He is using two Novation Launchpads to control mix, launch clips and scenes, and to control devices. The entire rig is mounted on a custom tube system which is strapped to a V-Stand and can be packed into a flight case. 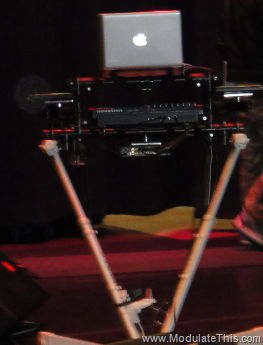 Speaking of this, he mentioned that this is the only rig the entire band transport. 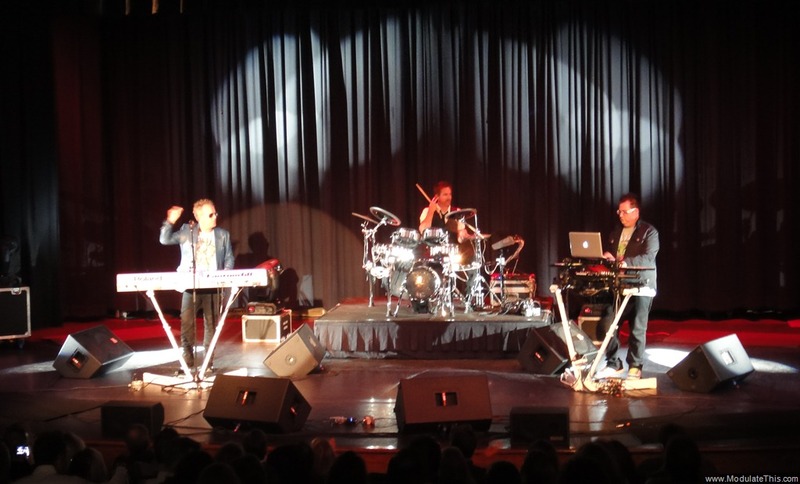 Howard’s Fantom G8 and Jonathan’s drum kit – I believe it was a a Roland TD-20s V-Pro™ Series – are provided locally. So they show up and load their sounds prior to the show. Now that’ s a small carbon footprint. Howard played all his parts from the Fantom G8. Patches either sounded either spot on from album versions, or where updated and freshened up but still worked very well. Both Howard Jones and Duncan Sheik took time out after the show to do a meet and great for all attendees at the lounge at the back of the theatre which was really cool for the fans. After talking with Robbie, I did manage to get up there and was last in line and briefly met both Howard and Duncan who graciously signed my 25th Anniversary concert at the indigO2 DVD :^). What a great night. The music and performances were fantastic and the crowd was really into it and often sang along. 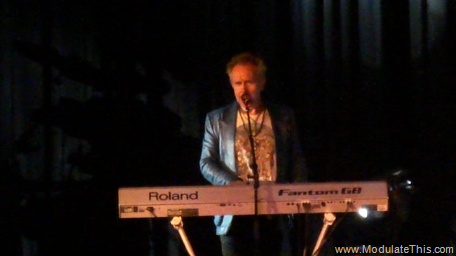 While this was the last show of this short American tour, I recommend you visit http://howardjones.com/touring.html to stay informed about upcoming shows.